Warranty description: Because we have no control over working conditions or methods, our liability is limited to the price of this product. 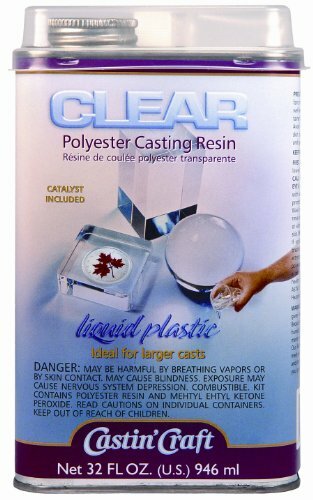 Castin&apos;craft clear polyester casting resin casting is an exciting and fun craft that allows you to embed or encase almost any object in crystal clear plastic. Contains 32-Ounce casting resin and 1/2 -Ounce catalyst. Castin'craft clear polyester casting resin casting is an exciting and fun craft that allows you to embed or encase almost any object in crystal clear plastic. Coins, shells, rocks, dried flowers, butterflies and insects are just a few of the examples of embedment possibilities. This convenient new package includes catalyst in a clear bubble top cap. Warranty Because we have no control over working conditions or methods, our liability is limited to the price of this product. Warranty Description Because we have no control over working conditions or methods, our liability is limited to the price of this product.